09.45-11.15 บรรยายพิเศษ “ปรัชญาและศาสนาในระบบการศึกษาไทย: มายาคติกับความเป็นจริง”/ พระพรหมบัณฑิต, ศ. ดร. อธิการบดี มจร. 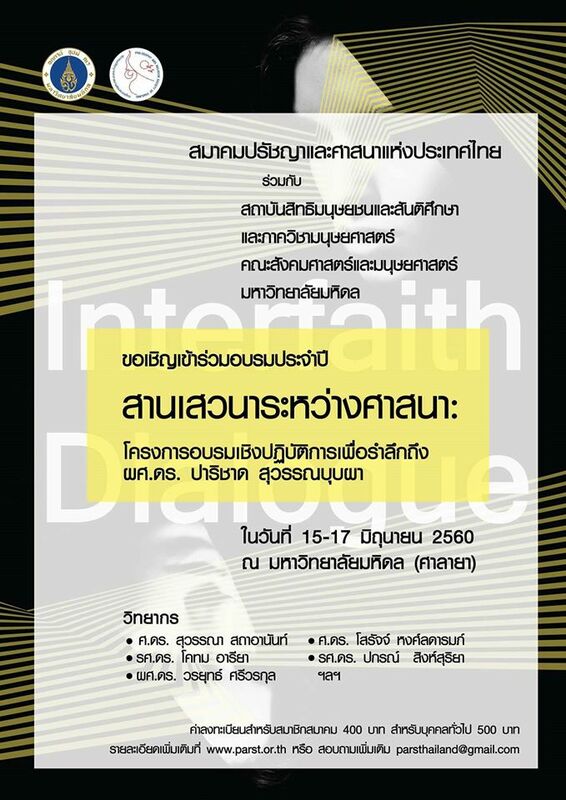 This year’s annual meeting of the Philosophy and Religion Society of Thailand will be held at the campus of Mahachulalongkornrajavidyalaya University, Khon Kaen campus, Khon Kaen, Thailand, on December 15 to 16, 2018. The theme of the conference this year is “Philosophy and Religion in the Thai Education System: Myths and Realities”. Papers do not have to be directly related to the theme of the conference, but they need to be within either philosophy or religion. Each submitted paper will be reviewed by a selection committee to be set up by the Society. Papers must be no more than 10 A4 pages long, including all notes and references, and they can be written in either English or Thai. The last day for submitting papers is November 15, 2017. Those who submitted papers will be notified of the result by November 30. Papers presented at the annual meeting will then again be selected for possible publication in the Journal of the Society.